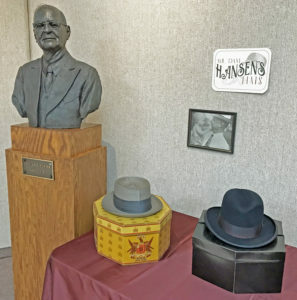 Recently several of Mr. Hansen’s hat boxes and hats were rescued from storage. It was decided that these new found treasurers needed to be displayed in the Museum. As we were setting up Mr. Hansen’s Hats, we talked about how styles have changed and wondered what drove men’s dress hats basically to extinction. Why did men stop wearing hats? I am not talking ball caps, but styles such as the Hamburg, Derby, Bowler, Fedora – you get the drift. After doing a little research, it appears that the main culprit maybe the car. As closed cars became more and more popular, men had less need to cover their heads. Furthermore, the personal car actually made hat wearing inconvenient. Most men were too tall to keep their hats on while driving. Two presidents also get tossed around in the blame game for the decline of men’s hats. Eisenhower and his implementation of the interstate highway system making travel by personal vehicle more assessible and JFK and his lack of hat at his inaugural ceremony. JFK wore a top hat to his inauguration, but removed it before addressing the crowd. It seems JFK often carried a hat, but rarely covered his gorgeous head of hair. Mr. Hansen’s Hats are stunning pieces of head attire. Each was custom made for Mr. Hansen by premier hatter, the Knox Hat Company of New York. Knox Hats were accustomed to covering the heads of great men. President Lincoln’s famous ‘Stovepipe’ hat was a Knox and Lincoln was known to keep important papers in his ‘Knox Stovepipe’. Mr. Hansen had many beautiful hats, but he also wore numerous “hats” each day. Business man, philanthropist, entrepreneur, family man, mentor, outstanding citizen, Republican, and friend just to name a few of the multiple “hats” Mr. Hansen wore daily. We invite you in to see and try on Mr. Hansen’s Hats. You might find yourself inspired by Mr. Hansen’s wisdom, common sense, and entrepreneurial spirit while wearing one of his hats. 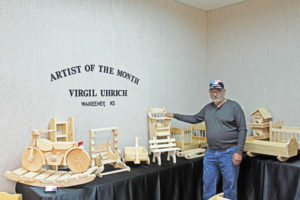 Virgil Uhrich of WaKeeney is October’s Artist of the Month. Virgil is a wood worker extraordinaire and specializes in items that delight and amaze children. The Artist of the Month area is filled to the brim with exquisitely crafted rocking horses, cradles, desk & chair sets, toy boxes, rocking airplanes, birdhouses, and more. Virgil’s prices are extremely affordable, and all Dane G. Hansen Museum members get an additional 5% off Artist of the Month purchases.